It is so nice to fit into these new jeans of yours, isn’t it? But hold on, what is that hanging over on each side of you? Oh, well, love handles, right? How many of you have been telling yourself the same instead of starting to work to get rid of these nasty muffin tops? The number is significant, but there is no time for excuses, since we have found out a nice set of exercises to relieve you of this misery. There are only 8 exercises required to help you get rid of muffin tops, but the thing is that you have to carry out the requirements precisely. In case you are ready for that- what are we waiting for? 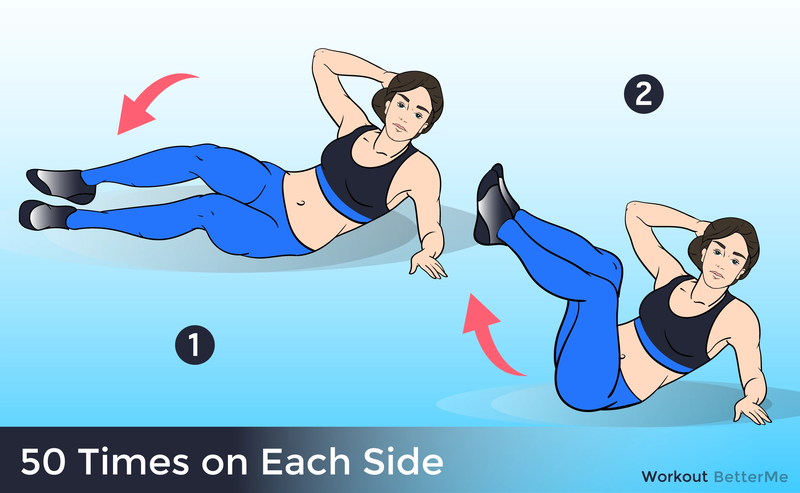 - Lie flat on an exercise mat on the floor keeping your lower back straight with no arching of your spine and with your knees bent and feet flat on the floor. Place your hands lightly on the sides of your head. - Curl your torso upwards so your shoulders are slightly raised off the floor.. Raise your knees until your thighs are at a right angle to the floor and your calves are parallel to the floor. This is the start position. - Slowly move your legs in a pedaling action as if you are riding a bicycle. As you do so, exhale and bring your opposing elbow close to each knee by crunching to one side. Left elbow to right knee. Right elbow to left knee. - Lie on a padded surface on your left side. Stack your legs and bring your right hand behind your head. Lie your left arm in front of you or across your body. Brace your core. - Pulling from the obliques, bring your elbow up and towards your feet. Do NOT pull yourself with your hand. - Pause and feel the contraction in your obliques then slowly return to the starting position. 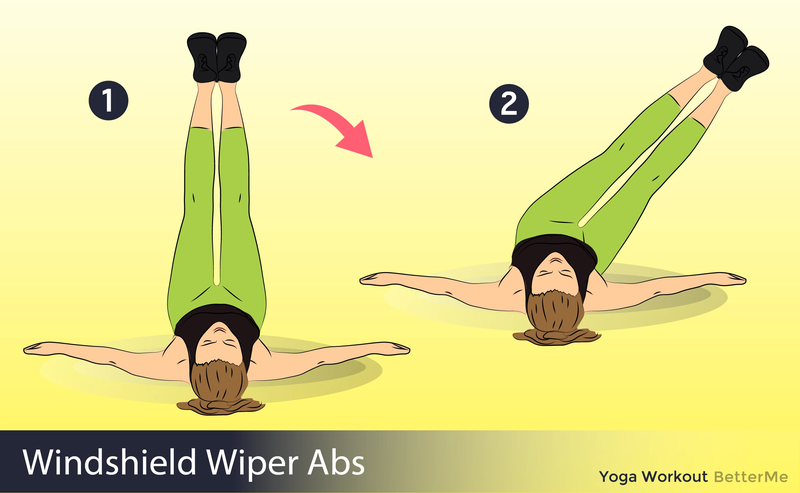 - Sit on an exercise mat with your legs fully extended and your upper body upright. Cross your your ankles and raise them off the floor slightly. - Bend your knees towards you slightly. Lean back about 15 degrees to balance your body. This is the start position. 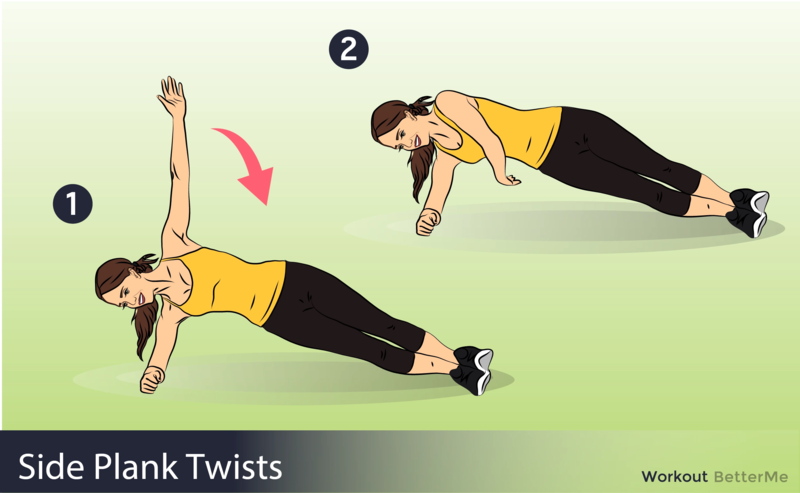 - In a smooth motion,turn your torso to the left and touch the plate on the floor. Make sure you exhale as you do this. - Return to the start position inhaling as you do so. Repeat the same movement, this time to your right side, again exhaling as you do so. Return to start position and repeat. - Lie on your right side with your legs straight. - Prop yourself up with your right forearm so your body forms a diagonal line. - Rest your left hand on your hip. - Brace your abs and hold for 60 seconds. - If you can't make it to 60 seconds, hold for 5 to 10 seconds and rest for 5; continue for 1 minute. - Be sure your hips and knees stay off the floor. 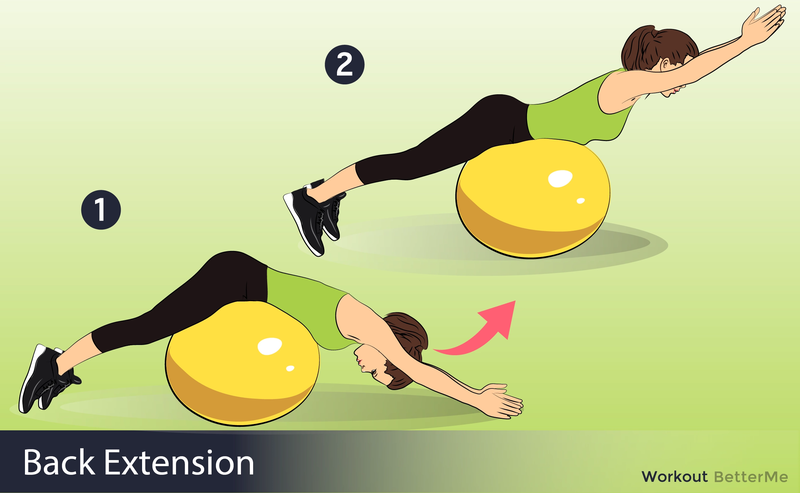 - Lie prone on a swiss ball with your feet hip width apart. You can place your feet against a wall for better stability. Clasp your hands behind your head with elbows pointing out. - Engage your abs and raise your torso off the ball, hyperextending your spine. - Return your torso to the ball to the starting position. - Lie on an exercise mat, keeping your back flat with no arching of the spine. Extend your arms out beside you at shoulder level, with your palms pressed firmly to the floor. Your upper body should form a “T” shape. - Raise your feet off the floor by bending your hips and knees to 90 degree angles. This is the start position. As you exhale, rotate both your thighs to one side until the outer thigh touches the ground or until you feel a stretch in your abs and lower back. - Pause briefly, then rotate to the other side without pausing in the start position. When you have rotated to both sides, that is one repetition. Repeat for the desired number of repetitions.